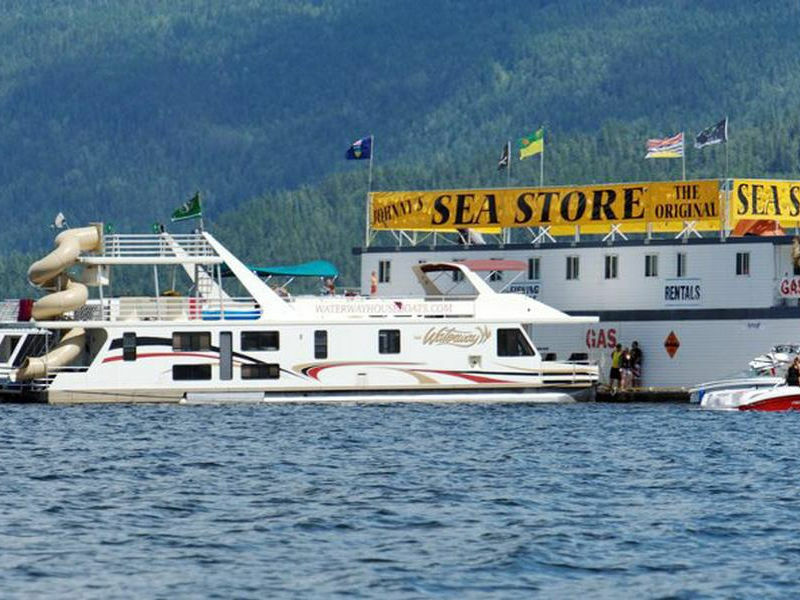 State of the art for houseboat vacationing. 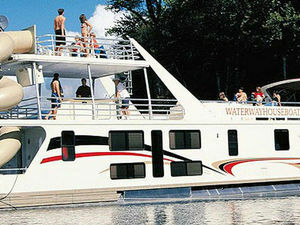 Waterway's largest vessel features mega-houseboat personality, exquisite comfort, style and safety. 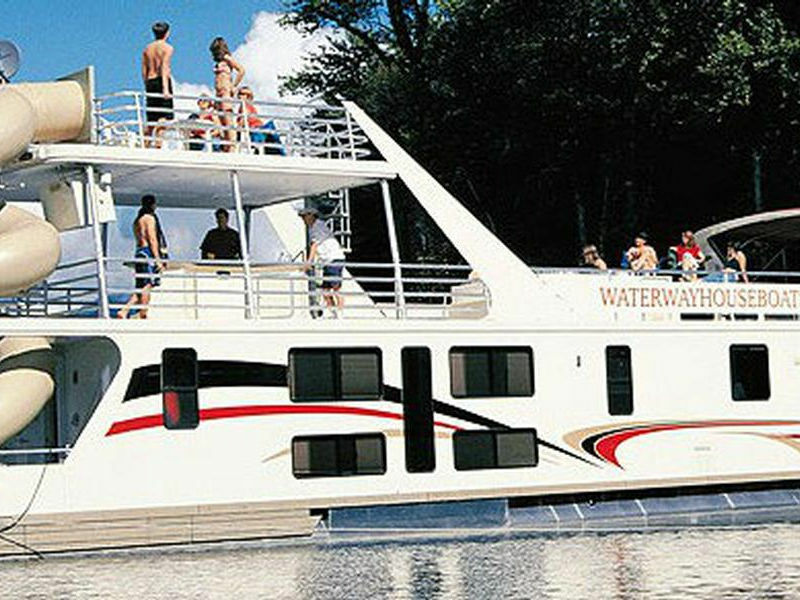 Step aboard and enjoy the large sky light over the dinette, direct/indirect lighting, entertainment center with fireplace, AM/FM surround sound stereo, CD player, satellite, and TV/DVD player. 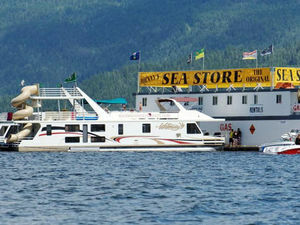 A fully equipped galley with refrigerator, dishwasher, range, wine rack, and 2 outdoor propane BBQs on the front deck. 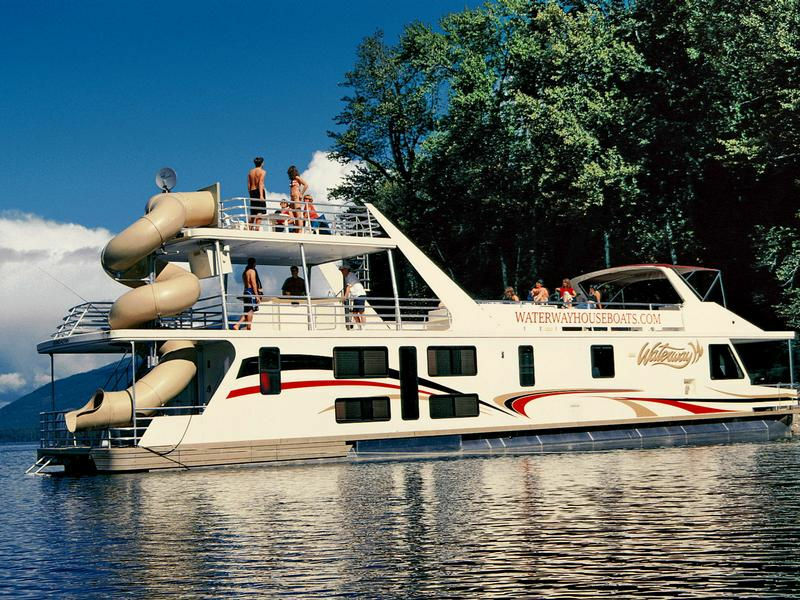 Perfect for parties, the spacious upper deck with hot tub, wet bar, stereo, waterslide, fly bridge, bimini top and 3rd level observation deck. 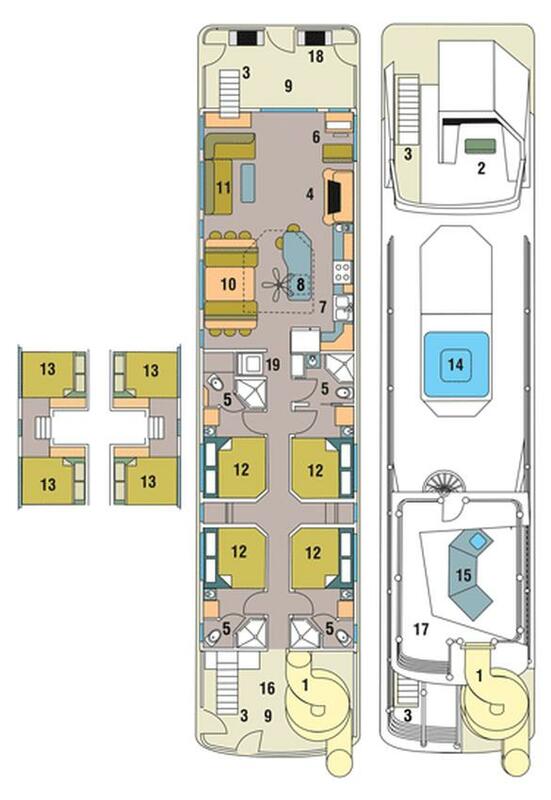 The 4 staterooms on the Genesis 75 come with a King size bed, TV/DVD, fan, storage, a vanity, and en suite head with glass enclosed shower. 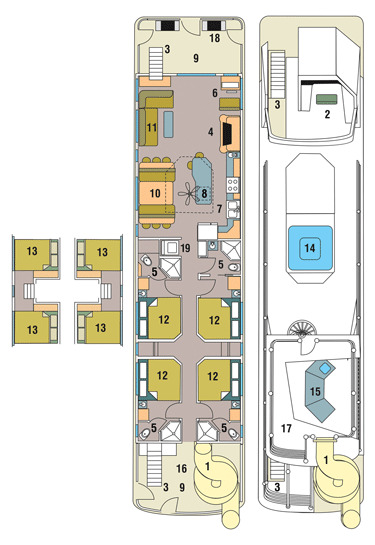 The four lower walkdown staterooms come with queen size beds, fans, direct lighting, storage and large windows to let the natural light in. 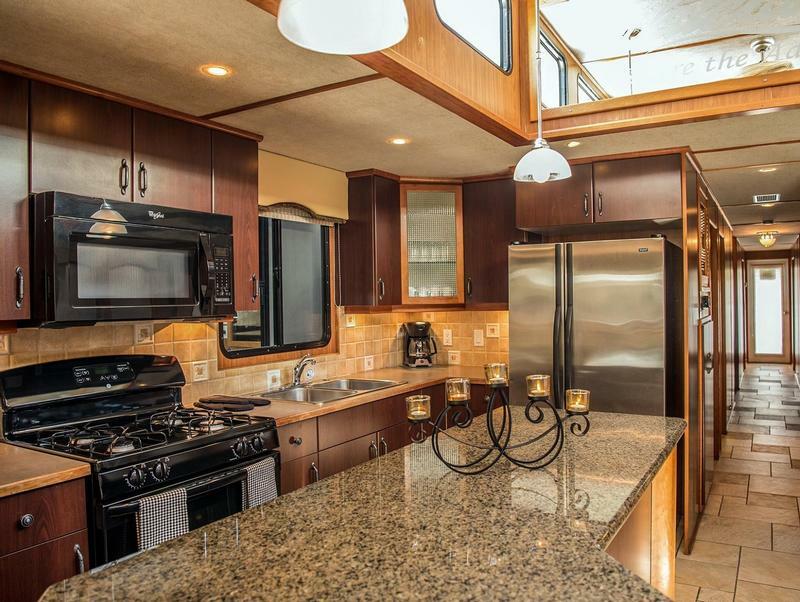 The chef has a pleasant view with plenty of counter space in the fully equipped galley, where the dishwasher and all the usual appliances are tucked under the corian countertop, and the beautiful finished cabinets with the wine rack. 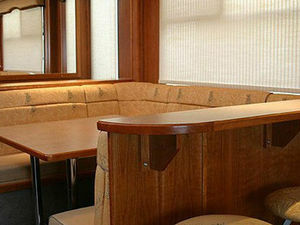 Enjoy meals seated at the comfortable dinette which also converts down to a bed. 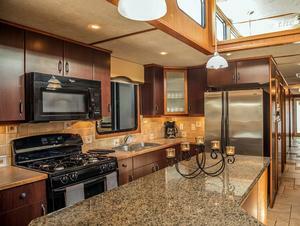 Sliding glass doors lead out to the front deck and to the 2 outdoor propane BBQs. 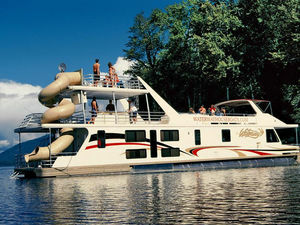 The distinctive profile and the sensational mega-houseboat personality of the Genesis 75 sets it apart. 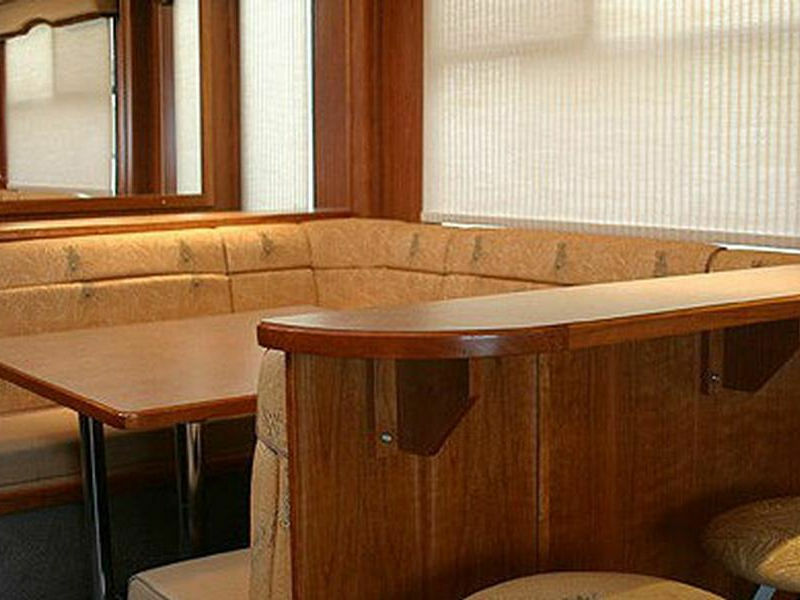 Step aboard and enjoy the dynamite lounge area with a comfortable sofa that makes down into a bed, large sky light, oversized windows and direct/indirect lighting will certainly catch the eye. An entertainment center with fireplace, and a AM/FM surround sound stereo with CD player, satellite TV with DVD player will surely satisfy all. The clever layout of the Genesis 75 provides expansive living quarters, that is perfect for a vacation adventure on the Shuswap. 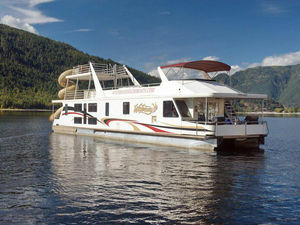 The rental rates listed do not include sales tax, environmental fees, fuel expenses, propane or other options. A down payment of $750 is due when you make a reservation. 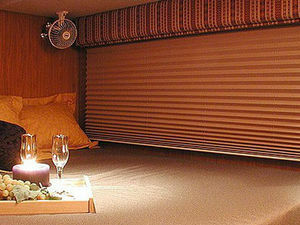 A refundable security deposit of $5000 is due upon arrival if you purchase the insurance option. 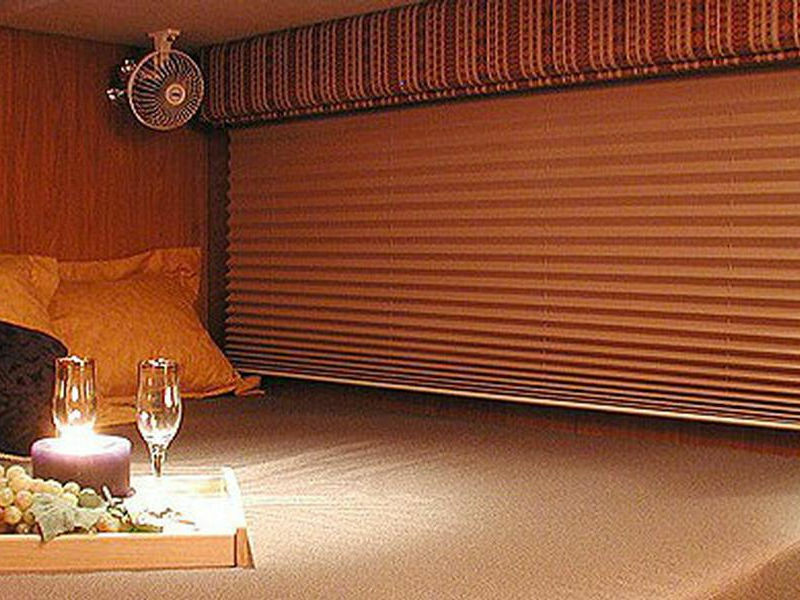 The refundable security deposit is $10000 without purchase of the insurance option.